In the minds of most of you the word "chest" means the front part of your upper-body; and when you say "chest muscles," what you really mean is the "pectorals" or breast-muscles. Since the word "chest" means "box," your chest is your rib-box. When you take your chest-measurement, you pass the tape all around the body, and you will be disappointed, or pleased, according to the size of your rib-box. If the rib-box is small, you will never show a really big chest measurement, even if the muscles on the breast and upper back are thick and highly-developed. On the other hand, the man who has a really big rib-box always shows a fine chest measurement, even if the upper-body muscles are comparatively under-developed. When the rib-box itself is large and the exterior muscles are highly-developed, then you can get a phenomenal chest measurement, like that of Lange, Hackenschmidt and other devotees of bar-bell exercise. The chest and lungs are the storehouses of your power. A big rib-box means plenty of room for the lungs. Big lungs are of immense value to the super-strong man. They enable him to keep up for many minutes at a time exertions which would exhaust the ordinary individual in the course of a few seconds. Therefore, your first aim should be to increase the size of the rib-box; and even if you do not intend to try for super-strength, or if you are not interested in any other kind of exercise, I most earnestly recommend you to practise the movement described in the following paragraphs. A few months' daily practice will increase the girth of your rib-box by several inches. As the rib box grows larger, the shoulders will get proportionately broader; the lungs will get bigger; and you will find that you will have vastly more endurance as the size and power of the lungs increases. Furthermore, you will find that your arms and legs will develop almost automatically. A big-chested man can get arm and leg development at a much more rapid pace than can the man who has a small rib-box, and correspondingly small lungs. It is comparatively easy to "pack" muscle on the upper-back; and it is no trouble at all to get big muscles on the breast; but the man who has such development of the superficial muscles, while he may present a nice appearance, will not have super-strength. I have found that if a man can increase the girth of the rib-box by six or eight inches, that his shoulder blades will set themselves farther apart, thus widening his upper-back; also, that in some mysterious way the shoulders seem to re-adjust themselves in a way that makes for longer leverage, and hence greater power, in the muscles on the upper-body. You will often find that a broad-shouldered man with moderate development is much stronger than a heavy-muscled man who has narrow shoulders. This is due, in part, to the extra lung capacity; that is, the bigger "power-storehouse" which the broad-shouldered man possesses; and, in part, to muscular leverage. It is almost impossible to conceive a really big-chested man with narrow shoulders; just as it is impossible to make a mental picture of a man with, say a 45-inch chest, with shoulders only 16 or 17 inches in breadth. A man with a 32-inch chest will probably measure less than 16 inches from the point of one shoulder to the other; a man with a 40-inch chest will go about 19 inches across the shoulders; whereas, a giant like Zottman has shoulders nearly 24 inches across, to match his 46-inch chest. Part of the width of the shoulders is due to the development of the deltoid muscles on the point of the shoulders; and in most big-chested men these muscles are very thick and strong. The deltoids are involved in any scheme for chest development; by which I mean that in order to increase the size of the true chest, it is necessary to perform exercises which involve the deltoid muscles. The very best exercise for increasing the size of the rib-box is the following: Lie flat on the back; take a light bar-bell and pull it across the face to the chest; push it to arms' length, as in Fig. 41; and then, keeping the arms stiff and straight, you lower the bell in a quarter-circle movement until it rests on the floor at arms' length beyond the head. (Fig. 42 shows it part way down.) Still keeping the arms stiff and straight, you raise the bell again until it is above the chest. 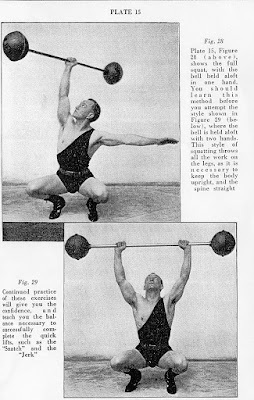 I have seen some men practise this exercise faithfully and get only a 2- or 3-inch increase in chest measurement; and I have seen others do it no oftener and get an increase of 8 or 9 inches. Prof. H.B. Lange, who had a 36-inch chest at the age of 30, has gotten his chest measurement up to more than 50 inches. Most of the increase he ascribes to intelligent practice of this exercise. Occasionally, when a student complains to me that while his strength is rapidly increasing, he is not gaining in size, I take him off all the other work and make him practise this exercise exclusively every day (and sometimes twice a day), for a period of a month. I have seen men add 4 inches in one month to the size of their chests by this special work; and after they resumed their regular training program, the muscles all over their bodies grew in size at a surprising rate. By developing the upper back muscles, anyone can add to the width of his chest. The important thing is to make your chest deep from front to back; and the thing which controls the depth of your chest is the distance between your breast-bone and your spine. You can by doing gymnastics, such as horizontal-bar and "Roman-ring" work, so develop the upper muscles that your chest will appear very wide; but even if you develop the big muscles on your breast, the upper part of your chest will still be flat. If, however, you increase the depth of your chest, the upper chest will become high-arched, and spring out in a swelling curve right from the base of the neck, the way it does in some of the Greek athletes whose statues you have seen. There is an author by the name of Talbot Mundy who is very fond of introducing "Strong Men" into his stories. In his tales of India and the Far East, his Herculean character, Jeff Ramsden, is continually getting into personal combat with gigantic Arabs or East Indians. Mr. Mundy does not tell of professional "Strong Men" or vaudeville performers, but of natural "Strong Men"; and whenever he introduces such a character, he almost always says that the man in question has broad shoulders and is "ribbed-up like a race-horse." The minute you think of a race-horse, you get a picture in your mind of a slender-waisted animal with an enormously deep chest. If you could see the skeleton of race-horse you'd notice that the rear-ribs are small and that each pair of ribs seems to get longer; until when you get to the front and longest pairs, the depth of the race-horse's chest is as great as that of a 2000-lb. truck horse. Now, if a man has a chest "like a race-horse," it means that the ribs which fasten to the breast-bone are unusually long, and that his chest is unusually deep from front to back. Mr. Mundy evidently knows the trade-marks of a natural "Strong Man," because he emphasizes the one great essential, and that is the rib-box which is deep from front to back. Technically, this chest-exercise is known as the "two-arm pull-over," which is rarely used as a competitive lift. Any man who can raise a 100-lb. bar-bell from the floor to above his chest with straight arms, is very unusually strong. I have heard stories of men raising 150 lbs. in this way, but I have never seen anyone do more than 120 lbs. The correct thing for you to do is never to practice it as a lift, but as an exercise; (that is, until you have had many months' experience). If you spend your time in trying to see how much weight you can raise, you will spoil it as a developing exercise, because the developing effect comes mostly from the manner in which you lower the bell. If you fail to get results from practicing, the fault is not with the exercise but with you. In the first place, the arms must be stiff and straight, and that means that they must not be bent the least trifle at the elbows. I have seen men do the exercise with the arms slightly bent at the elbow; and because they didn't bend the arms any further while raising the bell, they would insist that their arms were straight. The moment you bend the arms at the elbow, you throw more work on arm muscles and less on the muscles which control the ribs. The correct way is to lower the bell slowly; and as you lower it, you must take a deep breath and spread the ribs as far apart as possible. As you raise the bell, you breathe out. It is a vital mistake to use too much weight or to count the repetitions. The act of counting distracts your attention, which should be concentrated on the correct performance of the movement. You should lower and raise the bell as many times as you comfortably can. Another important detail is to keep the lower part of the spine as straight as possible. As you lower the bell you will feel a natural impulse to arch the lower part of the spine and to allow the small of the back to raise from the floor. The farther the lower back leaves the floor, the less the ribs will spread; so you must try to prevent your abdomen from rising in the air as you lower the bell. If you weight less than 135 lbs. and have had no experience, use a 25-lb., or even a 20-lb., bar-bell. If you weight 150 lbs. and are in fair condition, use a 30-lb. bar-bell; and if you are a 200-lb. man, in good shape, you can use 40 or 45 lbs. I caution you against using a definite progressive schedule. It will be sufficient if you increase the weight of the bell 2 1/2 lbs. a month; and I believe that 50 lbs. is enough for any man to use in this exercise for the purpose of chest development. When I said above that you must take a deep breath as you lower the bell, I did not mean that you were to pack the lungs with air to such an extent that your eyes pop out and your face becomes red. The bell must be lowered slowly, but not very slowly. This stunt will give you a wonderful chest development if you follow the above directions. Incidentally, the act of raising the bell will develop the muscles on the inside of the upper-arms and those across the broad of the back; but that development is incidental. It is a "by-product," because the aim of the exercise is to add size and flexibility to the rib-box. You can get all the development you can possible want on the outside of your chest by practicing the exercises for the arms, shoulders and upper back, which will be described in subsequent chapters.